Trade tensions and worries about a cyclical peak in trucking are causing investors to hit the exit ramp. Check out the latest Wabco Holdings earnings call transcript. Truck component manufacturer Wabco Holdings (NYSE:WBC) dropped 11.6% in December, according to data provided by S&P Global Market Intelligence, on investor fears that the global commercial vehicle cycle has hit a peak. The December decline reversed an upward trend in the shares coming out of the company's third-quarter earnings, driving the shares down 25.2% for the full year. Wabco is a supplier of electronic, mechanical, electro-mechanical, and aerodynamic products primarily for commercial vehicles, and due to its strong engineering reputation, is expected to benefit from the long-term trend toward smarter more electric vehicles. The company early in December signed a $950 million, eight-year agreement with an unnamed commercial vehicle manufacturer to provide driver assistance systems and other technologies, and in November signed a deal with Hyundai Motor Co. to provide technologies to medium-duty trucks. Wabco hopes to be a major player in the trend toward vehicle electrification. Image source: Wabco Holdings. While that's great for the future, the near-term outlook is not so rosy. Wabco in September lowered 2018 guidance due to what it termed "intensification of geopolitical dynamics," namely the trade wars, and the shares in December were subject to a number of downgrades because of concerns that trucks are at a global cyclical peak and it might be a while before the company regains its momentum. Wabco generates only about one-fifth of its revenue from North America, and with significant exposure to China and a presence in other emerging markets including Russia and Turkey, its results could be subject to volatility in the quarters to come if trade wars continue and global economies slow. Wabco, a one-time Berkshire Hathaway holding, is an interesting long-term investment for those looking for exposure to important trends including electric vehicles, better fuel efficiency, and down the line, autonomous and connective vehicles. But given the macroeconomic trends, it appears unlikely a bet on Wabco will pay off handsomely in 2019. 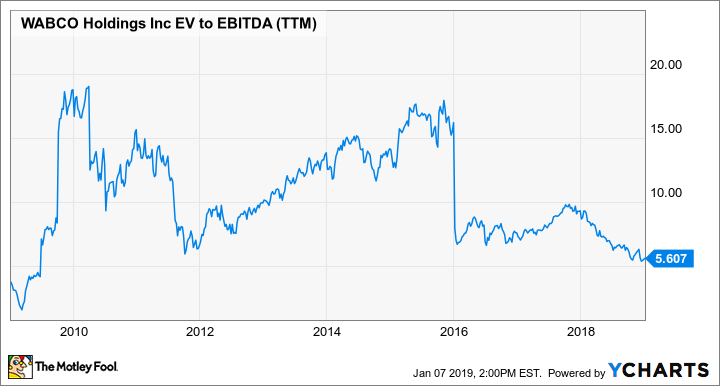 The company today trades at an enterprise value of about 5.6 times EBITDA (earnings before interest, taxes, depreciation, and amortization), which is about as cheap as it has been since the 2008-2009 recession. For an investor with a long time horizon, the recent drop provides an interesting entry point. However, make sure you understand going in that this is not going to be a short trip.